This photo of Christopher as a young man, was sent by Mattingley descendant Sophie - a treasured photo of a son lost to his NZ family. Christopher Malcolm Mattingley was b: 27 Dec 1886 in Temuka to parents Thomas and Sarah Mattingley. He attended the Temuka School from his home address at Arowhenua. A difference of opinion with his father in his teens saw Christopher leave home - it was thought that he went to WW1 and the family did not hear from him again. At age 25, Christopher boarded the ship "The Victoria" 1870 tons at the port of Auckland travelling steerage class, an unassisted passenger (i.e. fare paying) for Sydney where he arrived 8th March 1912 with his partner Naomi Coombs (nee Stringer)They were to share the next 34 years together bringing up their 2 surviving sons, until parted by death. 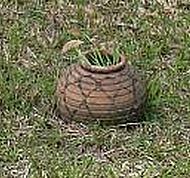 A clay pot marks their resting place at Rookwood Cemetery, Sydney. 1913: The Cumberland Argus and Fruitgrowers Advocate (Parramatta 20 Dec) Hornsby's Stray Cows Damage an Orchard. At the Hornsby Small Debts Court on Tuesday, Samuel George Truran proceeded against Christopher Mattingley and Win. Clark, of Keeking to recover from each £10 alleged to be the amount of damage done to his fruit trees by the defendants' cows. Legal assistance was engaged on each side. Plaintiff asserted that on the 18th Nov. he found two cows in his orchard. One cow belonged to Mattingley, and one to Clark. Portion of the dividing fence near the slip-rails was 'busted down' though secure the previous night. In all 23 fruit trees were damaged, seven being in full bearing. Trespass was admitted. The plaintiff alleged that the fruit was eaten by the cows, and the branches of the- trees were broken down. Mattingley had made him an offer of 30/- but Clark said he would fight the claim. Edward Higgins, an orchardist, residing in the Valley, Hornsby, stated that he had inspected the trees on Truran's place and no indication that any cows had damaged them, and at Truran's mother's place, five trees damaged. The damage was very little, and if the trees belonged to him, he would not count it as damage. A case would cover all the loss of this seasons fruit and two cases the loss of fruit that might have come next year. At 10s per case, this would amount to 30s. The S.M. : Did you see these trees before they were damaged? The witness: No. The S.M. Then how can you say how much they were damaged? "Any practical orchardist can tell at once how much damage a tree has sustained," was the reply. The Bench assessed the damage at £2 10s, per cow, and awarded 4s costs in addition against each owner. Christopher first appeared on the electoral roll in 1922 living at Coonabarra Road in Wahroonga in the Hornsby electorate. In 1932 Christopher purchased land at 78 Mary Street Merrylands in the Fairfield area. He built himself a ‘hessian hut’ on this land containing a workshop, bedroom and kitchen - the walls were whitewashed but the floors were solid dirt. Grandson Ken remembers his grandfather Christopher Malcolm Mattingley living by himself and despite being a carpenter by trade, his living conditions were poor. 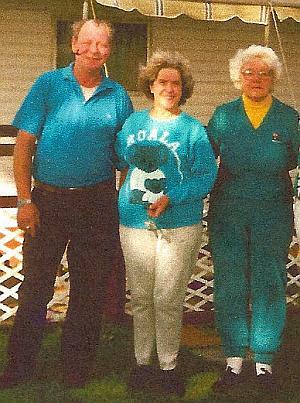 Christopher did not cook for himself and Ken would go along the road and get the old man who would have dinner each night with his son and family. In 1955 at Auburn, NSW, now 10 years old, Ken found Christopher dead and thought he was asleep. Fifty years later, discovered in Christopher's possessions, was this photo of him as a child with his mother, Sarah.